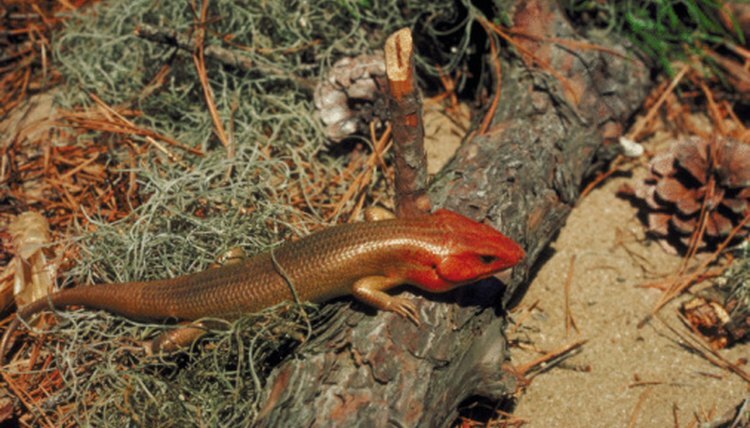 Commonly found in the wild throughout Georgia and South Carolina, five-lined skinks are also popular household pets. These reptiles are moderately large in size, growing to between 5 and 8 inches, but they can be comfortably kept in a home terrarium. In order to keep a five-lined skink happy and healthy in captivity there are certain needs that must be met. Before you purchase a skink to keep as a pet, learn as much as you can about them to determine how to create a suitable living environment. Set up a large glass tank or terrarium for your skink. While your skink is small, a 10-gallon tank may be sufficient but a long reptile-style tank of 20 or 30 gallons is best in the long run. Create a "hot" side and a "cool" side of the tank so your skink has a place to bask in the warmth and hide in the shade. Mount a heating lamp above the tank on one side of the aquarium and place an under-tank heating mat under the tank on the "hot" side. Monitor the temperature with an in-tank thermometer. Maintain the "hot" side of the tank as close to 80 degrees as possible. Provide a basking spot directly under the heat lamp and maintain the temperature there at 110 degrees. The "cool" side of the tank should be maintained at around 72 degrees. Fill the bottom of the tank with the substrate of your choice. A layer of clean potting soil over a bed of gravel works well though you may use shredded newspaper, if you desire, for easy clean up. Reptile-style sand also works well because it traps the heat from the heat lamp and helps to keep the "hot" side of the tank warmer. Decorate your skink's tank with artificial plants, rocks, and driftwood. Place a large, flat rock directly underneath the heating lamp to serve as a basking rock. In the cool side of the tank create a cave for your skink to use as a hiding place. You may purchase a commercial cave decoration from your local pet supply store or build your own cave out of rocks and driftwood. Provide your skink with fresh water daily and feed it every two days or so. Keep a shallow water dish in the "cool" side of the tank for your skink to drink from and soak in. Offer live crickets and meal worms to your skink and supplement this diet once in a while with reptile pellets or canned reptile food. Mist your skink and the tank itself with fresh water from a spray bottle every other day to keep the humidity up. Maintain a day/night cycle for your skink with 12 hours of daylight and 12 hours of darkness every day. If you are unable to keep this schedule yourself, plug the lights in to a timer. Ensure that your skink gets the right vitamins and minerals in its diet by dusting its crickets and meal worms with a calcium or multivitamin powder designed for reptiles. To dust crickets or meal worms with powder, place them in a plastic bag and sprinkle in a small amount of the powder. Shake the bag gently to distribute the powder.